Prominent & Leading Wholesale Trader from Vadodara, we offer siddha mala and gauri shankar kantha. Siddha Mala is a magical combination which includes 1 to 14 Mukhi, Gaurishankar, and Ganesh Rudraksha. According to Puranas, the person who wears all 1 to 14 Mukhi Nepali Rudraksha becomes Lord Shivas incarnate. This mala may be worn or kept at an altar for worship. 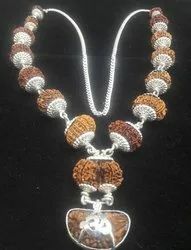 This has Rudraksha beads representing all device deltas and planets. This is the most powerful healing mala. The mala is used to sublimate the malefic effect of all Navara has such as lack of peace, poverty, lack of harmony, financial problems, health problems etc. Gives immense power to the wearer and help him to get rid of all problems. It is said that by wearing male the wearer can gain both ways, spiritual and materialistic. Siddha Mala bars any type of ill effect that occurs due to astrological reasons. 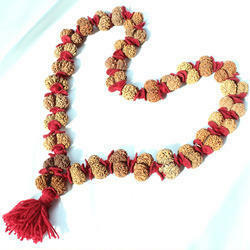 In addition to wearing Rudraksha, one gains peace happiness and harmony in life. Our company is the trusted name among our customers for offering Gauri Shankar Kantha that brings harmony and unity in the house where it is kept. This powerful Kantha is made from 32 beads with the help of wool thread and wool spacers. Most commonly worn by gurus and holy saints, the offered kanthas brings protection and divine grace to the wearer.